Case Type Keep Case (Amaray) DVD Extras: Cast and Crew Bios, HBO First Look: Making the Matrix, Feature Lenghth: Audio Track Commentary, Music Only Audio Track with Comentary by Jon Davis, Follow the white Rabbit, Take the red pill. DVD-ROM: The One, Special Web Events, Screenplay and Storyboards, 7 Special essays and articles, Do you know Kung-Fu, Follow the white rabbit, Original Theatrical Web Site, Theatrical Trailer Sampler. IMDB Rating 8.6 DVD-ROM PC Friendly, The Matrix Web Site, And alot more. The Matrix movie is awesome. This is the movie of the future because it has set a new standard of Mixing good movie with Special Effects. The fighting and shooting scenes are cartoon/John Woo like but better. It also very cool that the actors did all the stunts themself with many months of training. This is a movie that everyone should see on DVD. The DVD contains tons of extras and are very awesome to watch. I think there's a total of 3-3.5 Hours of Video on this DVD with everything on the same DVD side. There are tons of DVD-ROM features as well. It's a shame not to have this DVD in the collection, so people buy it now. HUMANS ARE NO LONGER BORN. THEY ARE GROWN! Here it finally is. The science fiction/action/thriller -- THE MATRIX. What a ride. Some scenes in this movie is just... you gotta go WHOW! 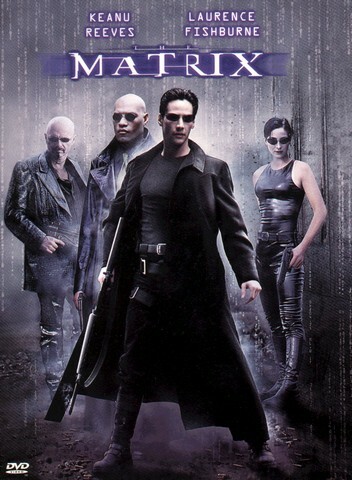 Forget Star Wars, The Matrix is the beginning of a new time when it comes to filmmaking. The Wachowski`s are geniouses. This isn`t just another Science Fiction film, this is "THE SCIENCE FICTION FILM"!! IT IS THE KING! Surely The Matrix can only receive a top score - a giant 6 on the scale. Unfortunately no one can be told what The Matrix is.